Our Lady of the Assumption Catholic Church - Stained Glass Inc. In 2012 Stained Glass Inc. was contacted by Fr. Rommel of the Our Lady of the Assumption Catholic Church in Johnson Bayou, LA to work on thirteen stained glass windows for their chapel. Our Lady of the Assumption had been destroyed by Hurricane Rita in 2005 and the congregation was seeking beautiful stained glass to adorn their rebuilt church building. They chose 13 window designs from our gallery, featuring different events from the life of Mary and our stained glass artists at Stained Glass Inc. created custom designed Gothic borders for each piece. As church goers enter the building they are greeted by an arched transom window at the main door to the church and two stained glass window inserts are featured in the church foyer. Once parishioners enter the chapel itself they are surrounded by the stunning stained glass that is featured along the walls. 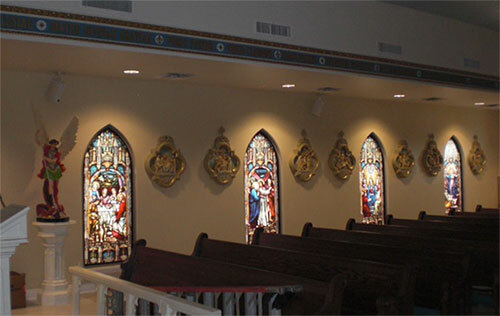 Each stained glass insert shines with a unique image and each image is surrounded by a custom made Gothic style border that was designed to fit flawlessly with the church's style and existing décor. These thirteen windows add striking color and charm to the church and bring hope to its parishioners. To add beautiful, affordable stained glass inserts to your church, give us a call today. We will work with you to perfect your stained glass designs that fit effortlessly into your place of worship. Stained glass inserts are affordable and lead free and will last for generations.